Maersk is one of the more prominent ‘mega-carriers’ in the world, so in this issue we will focus on one of the trade areas where you provide service. Africa is a developing country and so is the area of West Africa. 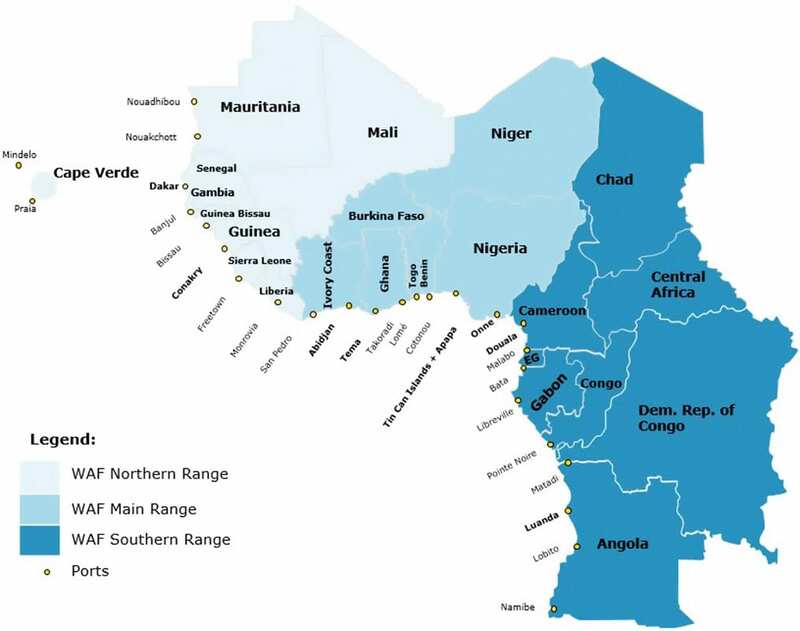 From the viewpoint of Maersk Line, what countries/area constitutes West Africa? Africa is definitely a developing area and more specifically West Africa is of high strategic importance. From a global standpoint, we consider West Africa to be the countries from Mauritania in the north to Angola in the south. The following map should give a good overview. I have given a few examples below and you can find a lot more info on www.maersk.com. From West Med, all major ports are used in our services directly from Algeciras and we also have direct products to Onne and Luanda from Lisbon, Leixoes (Portugal is considered West Med) and Malaga. East Med origins Ambarli, Canakkale, Izmir and Port Said all have direct and weekly services to Conakry. Other East Med origin ports and other West African destinations are provided for via transshipment and most on a weekly basis. We have weekly direct products from Shanghai, Ningbo, Nansha to Abidjan, Tema, Apapa, Tin Can Island, Onne and Luanda where Dakar, Conakry and Doula are, via T/S. From Xiamen we service Apapa, Tin Can Island and Onne directly. Other direct connections are Fuzhou to Tema, Shekou to Abidjan and Qingdao and Xingang to Luanda. The main direct products are from Singapore and Tanjung Pelepas to Abidjan, Tema, Apapa, Tin Can Island, Onne and Luanda via weekly service. Other ports are via T/S. We have weekly service to West Africa which is provided via transshipment. As cargo may originate from anywhere in the world, it can be a jungle sometimes to discover with whom we should speak and where to get a quote. Could you provide our readers with a few key names for the trade lanes mentioned? With the size of Maersk and the size of our network, we understand it can be challenging to find a specific person. In order to deal with this and to make it as easy as possible to ask for rates, we have created an online portal where customers can enter cargo details and receive quotes for service from anywhere in the world to anywhere in the world where Maersk operates. The online portal is available via our website and customers can obtain OOG, BBK and IG rates in the same place 24/7. We are also very happy to interact with our customers via email or phone of course. Our customers can either reach out to their local sales representative, or approach one of our Special Cargo team members, located in our regions, who can then guide them. Can you provide us with some examples of project cargoes that you have handled to/from West Africa? We are heavily involved in large industrial projects in West Africa where we are offering In Gauge, Out of Gauge and break bulk solutions together with standard dry – such as the Dangote Refinery. West Africa is growing in capabilities and we are investing a lot in the local OOG teams, which means our project cargo business is increasing every week. Actually, we recently loaded two masts and some drill pipe as break bulk going to China. It was the very first break bulk shipment to load in a container vessel from Walvis Bay. West Africa is a big region with several ports and there are different stages of development which will impede the handling of project cargoes etc. What kind of information would you need from a potential customer in order to provide them with a quick indication and quote? You are totally right about the fact that many places in West Africa are still not fully equipped to handle project cargoes. However I will say that, over the last few years, project cargo has become much more integrated into the Maersk organization, both in terms of our mindset as well as our physical capabilities. The overall ambition is that we be able to offer the same solid service to our customers, regardless of their cargo’s point of origin or destination. This, of course, means that our ports and terminals must live up to the global standards. So, the information needed for West Africa in order to accurately quote is the same as for other areas. First of all, we urge our customers to submit their requests via the online tool and fill out the template. It asks for all the information we need. Other than that, we ask customers to please let us know POL, POD, commodity, weight and dimensions, time of shipment and to provide a picture or diagram of the cargo as a minimum. With all this information we can give them a firm quote that is valid for thirty days. Are the ports generally geared to handle OOG and break bulk cargoes, or are there some ports that you, in particular, could recommend using to customers? Generally yes, our ports and terminals are geared to handle both OOG and break bulk cargoes. OOG has limitations itself, due to the equipment and, for BBK, of course there are restrictions at certain ports. Regardless, always make necessary checks and capability assessments. Why, in your opinion, should a customer approach Maersk Line for the West African region? What is your strength in the market in particular? Maersk is the most reliable container carrier and we offer fixed weekly services from all main regions. We are very dependable and can be trusted, as we stick to the rates and products we offer. We have been in Africa for more than fifty years and, with our own agencies and offices across West Africa offering strong local differentiators, we can assist the customer should any issue occur. Our reliability can also be seen with our fixed berthing windows in West Africa that allow us to arrive and depart on time while other carriers have to wait in cases of congestion. For our customers, we have made it very easy to get a quote and book cargo online. This is available for both Out of Gauge and In Gauge, via Maersk.com. Our customers can even combine their OOG and IG bookings with their standard dry bookings to cater for projects containing all types of cargo. Making these features available to our customers is a sign that Maersk understands the importance of project cargo and shows how much focus there is on this segment. Another sign of Maersk understanding the importance and sensitivity of projects is the fact that all Out of Gauge cargo has rolling priority. This really creates security for our customers and helps them deliver their projects. Security in the operation itself is important but security in pricing is also very important. For Out of Gauge, we have a standard thirty days validity period on all quotes. If you get a quote from most of the conventional carriers you will most likely receive the quote for a specific sailing. With a quote from Maersk, you can use that quote for any sailing within those thirty days. This brings true value to the planning of your shipments. Another one of the major strengths of booking special cargo with Maersk is our equipment availability. We have one of the largest fleets of special equipment in the world which gives our customers comfort and faith in us and our ability to deliver as promised. Shipping is very much a people’s business and thus it’s good for our readers to know you a bit. When/how did you decide to pursue a career in shipping? Actually, my dad got me started. He worked for Sealand for many years and he inspired me to get into shipping. Despite my dad working for Sealand, back then I didn’t actually start on the carrier side. My first job was with Danish freight forwarder Blue Water Shipping in 2004 and they really showed me the ropes. I had a great time and got a lot of experience working very closely with customers. I must have done a decent job as, after a few years, they stationed me in Houston. It then became really interesting, as I became acquainted with the project cargo segment and, as you know, Houston is so concentrated around project cargo and break bulk that you really can’t avoid becoming involved in it in one way or the other. Before following in my dad’s footsteps into a container carrier, I spent six years with two heavy lift multi-purpose carriers (Scan-Trans/Intermarine and Nordana), fully focusing on break bulk. Now I am back in Copenhagen, working for Maersk in a great team where we are focused every day on creating better customer experiences for our project cargo customers.